If you wish to learn how to fight, then there is one thing that you will need to do. And this thing is to conquer your fears of violence. One doesn’t go without the other. How can you hope to become a proficient fighter if you’re deathly afraid of coming in even the slightest contact with any prospect of physical violence whatsoever? To be fair, there isn’t a single sane person in the world that isn’t afraid of physical violence. It’s in our nature of humans to evade any prospects of physical violence whatsoever – as this may lead to serious injury or even death. That being said, it’s completely okay to feel anxious about getting into a fight. What’s not okay is for you to freeze and be deathly afraid every time you may need to fight someone. So, the best way to circumvent this big fear of yours is by facing it head-on in a controlled scenario. One of the best ways to do this is by finding a Muay Thai training camp. There you will be able to do all the training in the world that you will need in order to become a proficient martial artist and conquer your fears of violence. You will have to train hard, make no mistake about it. Muay Thai isn’t a joke. You will need to spend a lot of time in learning the basic techniques. You will need to kick, punch, and throw a knee here and there for good measure. All of these strikes are very powerful if your goal is to incapacitate your opponent. Which is what our next point is – you should never abuse your Muay Thai skills. The fact of the matter is that the power of Muay Thai to cripple someone is very much real. You should only use them to the extent you need in order to protect yourself and your close ones. Muay Thai is not about having bragging rights and about being able to beat somebody to a pulp. Being a martial artist is a lot deeper than that. But for now, you will need to just start training. 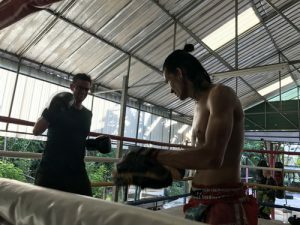 You will be able to ingrain these concepts later on in your journey to becoming a proficient martial artist with Muay Thai.